Some recipes are born by accident, others by necessity. You like buñuelos but can’t afford milk and eggs? Use a sweet potato and squash purée instead and make the Peruvian donuts — Picarones. The upper class chef throws away beef hearts? Marinade them in hot peppers and vinegar, grill them and make the Peruvian kebobs — Anticuchos. So if a recipe calls for prunes soaked in Pisco, what do you do with the leftover Pisco? You accidentally make a cocktail. There are many types of macerados that you can make with Pisco, such as infusions with coffee beans or fruits, herbs, and spices, all which can complement the flavor profile of the Pisco cocktail you want to make. And though some infusions take a long time, this prune infusion only took one hour. This cocktail may have been made by accident, but then again, when a dessert recipe calls for prunes soaked in Pisco, what I really read is Pisco infused with prunes. Presenting, the Pisco Prune Punch. 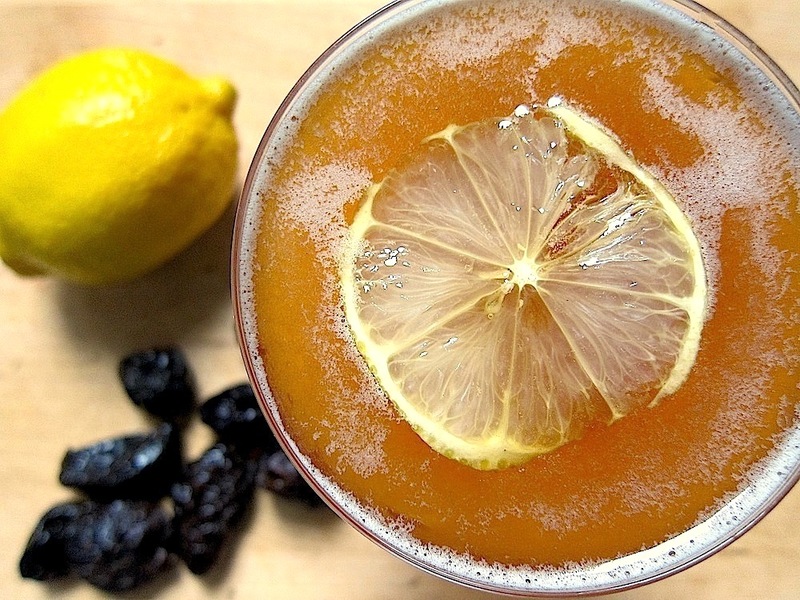 Mix the Pisco infused with prune, juice of 1 lemon, and simple syrup in a shaker. Add ice and shake for 30 seconds to chill. Serve strained in a coupe, and garnish with a lemon wheel. To prepare the Pisco infused with prune, soak 1 cup of coarsely chopped prunes with 1/2 cup Pisco for 1 hour. Strain the Pisco before using. Since some of the Pisco is absorbed by the Prunes, this should yield 2 oz. of infused Pisco. To prepare the simple syrup, mix equal parts water and sugar in a small saucepan, stir and bring to a boil until the sugar is dissolved. Let cool before using.